RETRACTED LENGTHS: 1, 2, 3, 4ft. EXTENDED LENGTHS: 6,11,16, and 22ft. radio equipment, telephone car carriers, etc. 300V working, 1 AMP carrying capacity. 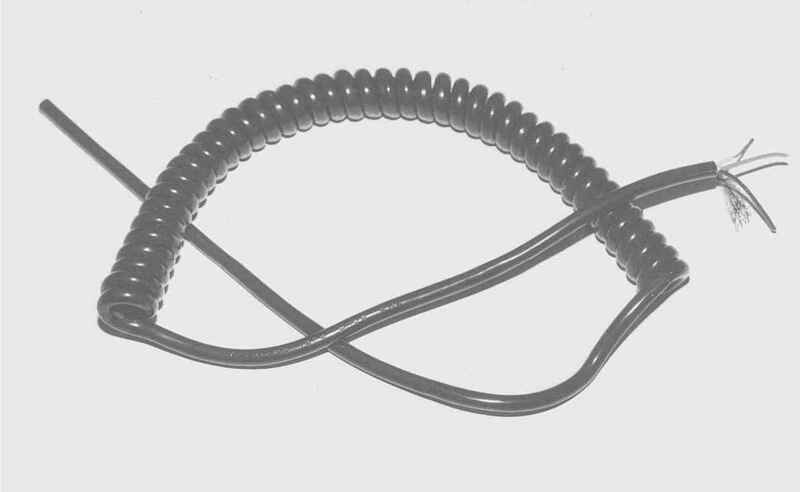 Nominal conductor resistance .022 Ohms per linear foot., .165 Ohms per retracted foot. 132-4 132-3 132-2 132-1 2 5/8" .185"
132/3-4 132/3-3 132/3-2 132/3-1 3 11/16" .195"
132/4-4 132/4-3 132/4-2 132/4-1 4 11/16" .205"
132/5-4 132/5-3 132/5-2 132/5-1 5 3/4" .220"
132/6-4 132/6-3 132/6-2 132/6-1 6 7/8" .230"
132/7-4 132/7-3 132/7-2 132/7-1 7 7/8" .240"
132/8-4 132/8-3 132/8-2 132/8-1 8 15/16" .250"
132/10-4 132/10-3 132/10-2 132/10-1 10 1" .285"
132/12-4 132/12-3 132/12-2 132/12-1 12 1 " .290"
132/15-4 132/15-3 132/15-2 132/15-1 15 1 1/16" .315"
9-Gray, 10-Pink, 11-Violet, 12-Tan, 13-White/Blk., 14-Red/Blk., 15-Green/Blk. + Stocked in Bryon™ only. TPE jacketed cords are available to order. RETRACTED LENGTHS: 1, 2 and 4 ft. EXTENDED LENGTHS: 6, 11 and 22 ft.
individually shielded & jacketed unless indicated. reliable as a mike cord. 1 AMP, 300V. Cond. AWG Strand. Nom. O.D. 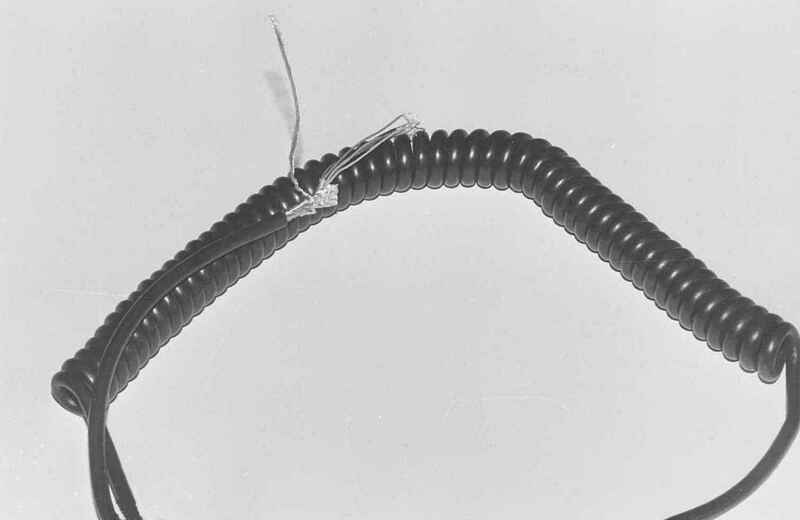 *Individual conductors are shielded and jacketed. **Conductors are individually shielded only. RETRACTED LENGTHS: 1, 2, 3, & 4 FT. EXTENDED LENGTHS: 5,10,15, & 20 FT.
conductors, Black BRYONTM jacket overall. UL approved for 1 AMP & 300V max. 135-4 135-3 135-2 135-1 1 5/8" .170"
135/2-4 135/2-3 135/2-2 135/2-1 2 11/16" .185"
135/3-4 135/3-3 135/3-2 135/3-1 3 3/4" .195"
135/4-4 135/4-3 135/4-2 135/4-1 4 13/16" .210"
135/5-4 135/5-3 135/5-2 135/5-1 5 7/8" .220"
135/6-4 135/6-3 135/6-2 135/6-1 6 15/16" .235"
135/7-4 ----- 135/7-2 135/7-1 7 1" .245"
135/8-4 ----- 135/8-2 135/8-1 8 1 1/16" .250"
RETRACTED Lengths: 1, 2 & 4 Ft. EXTENDED Lengths: 5,10 & 20 Ft.
118-4++ 118-2++ 118-1++ 2 28 19/40 1/2" .150"
118/3-4++ 118/3-2++ 118/3-1++ 3 28 19/40 1/2" .155"
119-4++ 119-2++ 119-1++ 4 28 19/40 1/2" .160"
125-4++ 125-2++ 125-1++ 5 28 19/40 9/16" .170"
125/6-4++ 125/6-2++ 125/6-1++ 6 28 19/40 5/8" .185"
125/7-4++ 125/7-2++ 125/7-1++ 7 28 19/40 5/8" .190"
126-4++ 126-2++ 126-1++ 8 28 19/40 5/8" .200"
---- 127-2 ---- 9 28 19/40 11/16" .220"
---- 127/10-2 ---- 10 28 19/40 3/4" .230"
---- 127/11-2 ---- 11 28 19/40 3/4" .240"
---- 127/12-2 ---- 12 28 19/40 7/8" .250"
---- 127/13-2 ---- 13 28 19/40 7/8" .260"
---- 127/15-2 ---- 15 28 19/40 1" .270"
---- 127/17-2 ---- 17 28 19/40 1" .280"
+Also avail. in TPE insulation--cable O.D. 's slightly larger. ++PVC Constructions are UL approved. 170/2-1 1 Ft. 2 28 19/40 19/32" .170"
170/4-1 1 Ft. 4 28 19/40 21/32" .185"
170/5-1 1 Ft. 5 28 19/40 23/32" .200"
170/6-1 1 Ft. 6 28 19/40 3/4" .210"
170/7-1 1 Ft. 7 28 19/40 25/32" .220"
170/8-1** 1 Ft. 8 28 19/40 13/16" .230"
170/9-1** 1 Ft. 9 28 19/40 7/8" .240"
170/10-1 1 Ft. 10 28 19/40 7/8" .250"
MODULAR PLUGS ARE AVAIL. FOR SOME OF THESE CABLES. *FCC DOCKET #.20780. 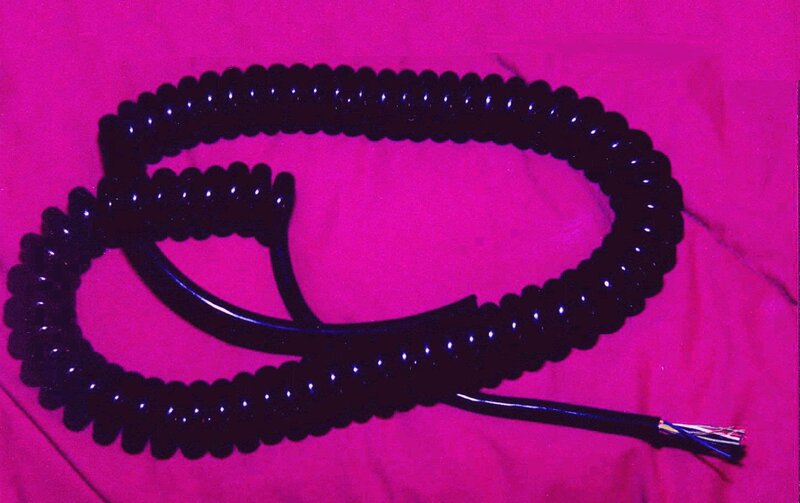 CORD SET RETRACTED: 18" EXTENDS TO APPX. 9 Ft. OPER.TEMP. : -20°C to +60°C. (SVO,SJO); -20°C TO +80°C (SVT,SJT) STD. PKG : 6. 120/3 3 18 41/34 SVO 1" .275"
123/3 3 18 41/34 SVT 7/8" .260"
121/3 3 18 41/34 SJO 1 3/8" .345"
124/3 3 18 41/34 SJT 1 3/8" .330"
122/3 3 16 65/34 SJO 1 7/16" .385"
RETRACTED LENGTHS: 1, 2, 3, & 4 ft. EXTENDED LENGTHS: 6, 11, 16, & 22ft. 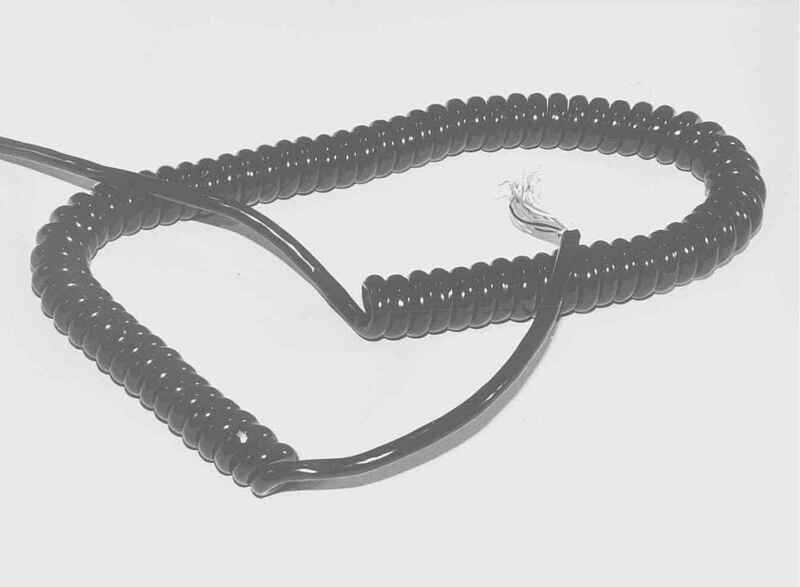 BRIM retractile cords are long lasting, and useful, where cords must change their length or position. OPER. TEMP. : -20°C to +60°C. VOLT. RATING: SVO SJ0 SVT & SJT -- 300V; SO & ST-- 600V. 165-4 165-3 165-2 165-1 2 41/34 18 SVT 7 3/4" .250"
165/3-4 165/3-3 165/3-2 165/3-1 3 41/34 18 SVT 7 7/8" .260"
166-4 166-3 166-2 166-1 2 41/34 18 SJT 7 1" .295"
166/3-4 166/3-3 166/3-2 166/3-1 3 41/34 18 SJT 7 1 3/8" .330"
166/4-4 166/4-3 166/4-2 166/4-1 4 41/34 18 SJT 5.6 1 3/8" .350"
166/5-4 166/5-3 166/5-2 166/5-1 5 41/34 18 SJT 5.6 1 1/2" .445"
168-4 168-3 168-2 168-1 2 41/34 18 ST 7 1 3/8" .375"
168/3-4 168/3-3 168/3-2 168/3-1 3 41/34 18 ST 7 1 7/16" .375"
168/4-4 168/4-3 168/4-2 168/4-1 4 41/34 18 ST 5.6 1 5/8" .400"
167-4 167-3 167-2 167-1 2 65/34 16 SJT 10 1 1/8" .315"
167/3-4 167/3-3 167/3-2 167/3-1 3 65/34 16 SJT 10 1 3/8" .355"
167/4-4 167/4-3 167/4-2 167/4-1 4 65/34 16 SJT 8 1 5/8" .410"
169-4 169-3 169-2 169-1 2 65/34 16 ST 10 1 3/8" .375"
169/3-4 169/3-3 169/3-2 169/3-1 3 65/34 16 ST 10 1 5/8" .390"
169/4-4 169/4-3 169/4-2 169/4-1 4 65/34 16 ST 8 1 5/8" .430"
164/3-4 164/3-3 164/3-2 164/3-1 3 41/30 14 SJT 15 1 9/16" .395"
163/3-4 163/3-3 163/3-2 163/3-1 3 65/30 12 SJT 20 1 5/8" .440"
FLAT/MODULAR RETRACTILE CORDS ARE AVAILABLE TO ORDER. Black ByronTM jacketed PVC test lead wire is available to order.